Villa with sea views for sale in Ramatuelle - low maintenance cost, panoramic views of the Pampelonne beach from all rooms. 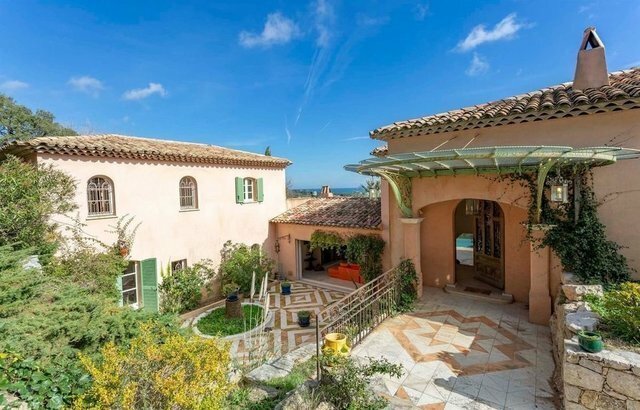 Located on the hills of Ramatuelle, a few minutes from the beaches of Pampelonne and a local shop, authentic Provencal house offering a beautiful view of the Ramatuelle countryside and the beaches of Pampelonne. The property offers 350 sqm of living space and two levels: a double living room, a separate fully equipped kitchen, and five bedrooms.In absolute calm, and protected from the Mistral, the house offers top of the range materials and services, including a marble floor for easy maintenance, electric shutters (2 buttons to secure the entire ground floor).Open on two terraces - including a covered patio - and with access to a beautiful infinity pool, the villa is organized in such a way that everyone enjoys a private area.The beautiful land of nearly 1 hectare - planted with umbrella pines and palm trees - and the small hacienda bring the final touch to this country house with great potential.The beaches of Ramatuelle are lined with numerous vineyards and enjoy a majestic coastline, offering superb panoramas.Built on a hillside facing the bay of Pampelonne, Ramatuelle is a charming typical Provençal village, with pink tiled roofs, stone houses with rustic doors and windows and narrow streets. Surrounded by ramparts, the village benefits from an exceptional panorama on the Mediterranean, and enjoys an immediate proximity with numerous creeks sheltering rich seabedsAn exceptional property, rare on the market, offered by Côte d'Azur Sotheby's International Realty, your luxury real estate agency in Ramatuelle and the Golf de Saint-Tropez.